I took a break from finishing the rudder last week to get the boat flipped over and take care of the hull finish. I'm not a good judge of weight, but I'd guess the hull is now in the 175 - 225 pound range. 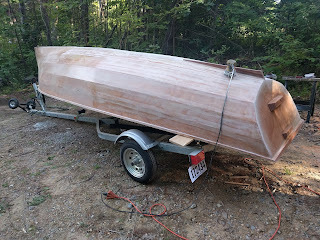 The boat is still pretty light but if I keep adding chunks of wood and various pieces it is going to get much harder to turn over, so I decided to get it done now. 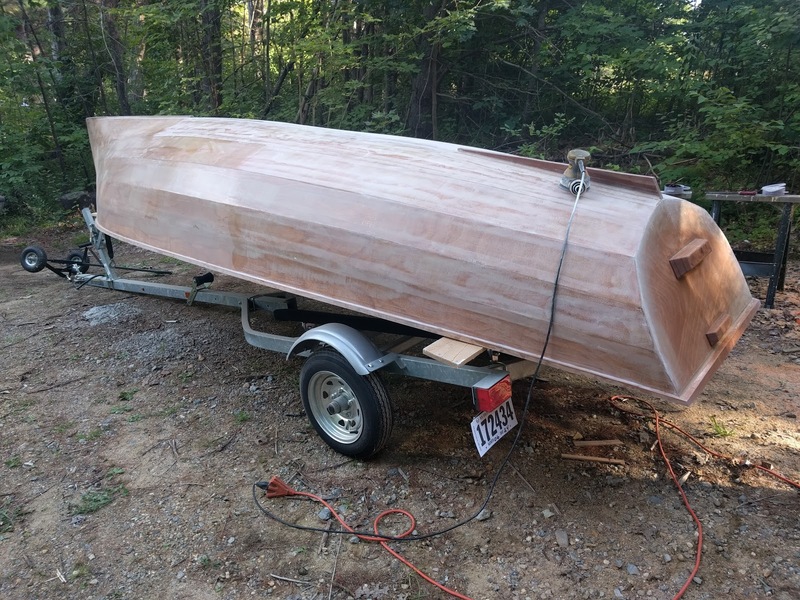 My son and I had little difficulty turning it over and I setup some boards on the trailer so the boat could rest upside down on it, allowing me to still wheel it in and out of the shop for the upcoming sanding sessions. I washed the hull to remove any amine blush on the surface although I've found that the Raka epoxy is fairly low blush. The hull had a layer of 6 oz cloth and 2 filler coats of epoxy to smooth out the weave, but there was still a bit of a rough weave texture, so once it dried out I sanded the whole thing down with 120 grit on my random orbit sander. I did a few spot fills of noticeable low spots with TotalBoat TotalFair fairing compound. I've been using this for a few years on various projects and like working with it. It uses a 1:1 ratio and one part is colored bright yellow, the other bright blue. You know that it is all mix well when they turn a uniform green. I've had trouble in the past with not properly mixing other fairing compounds because both parts are the same color and it's easy to miss fully mixing when you can't see a color change. Other than that it spreads out nicely and works just like any other fairing compound and cures to sand in about 3 hours. 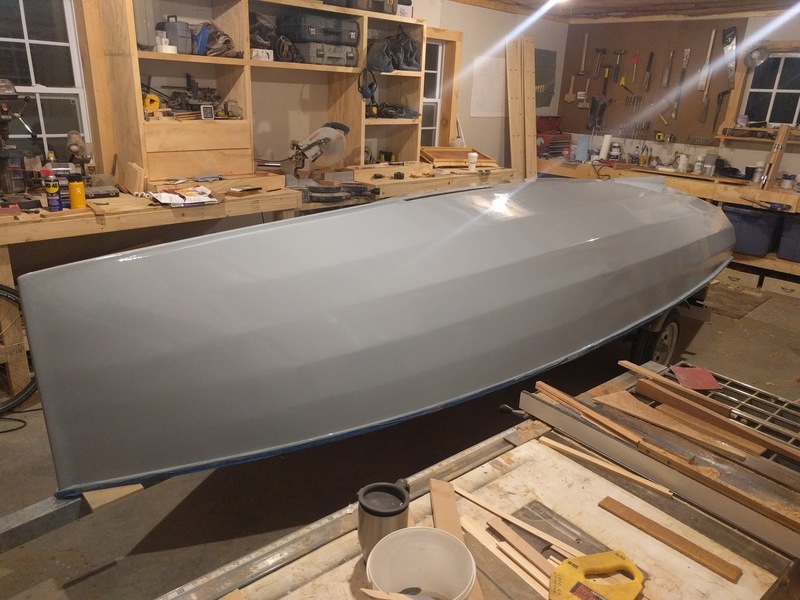 After sanding again, I rolled on a coat of high build one part primer (also TotalBoat) and let it harden up for a day or so. Now that I had a uniform color on the hull I could really see where filling was needed. The vast majority was on the hull panels in between the chine tape, although the bottom two panels starting from the keel were in pretty good shape. After sanding most of the first primer coat off, I mixed up several batches of fairing compound and slathered it on to get rid of the tape lines and waited for it to cure. Then it was time to sand again, and if you detected a pattern, you'd be right. Sanding was officially getting old now, but I kept telling myself that the prep is what matters, not the actual painting. Once sanded, it was again hard to tell where the low spots were because of the mottled color, but I was pretty sure I had gotten most of it. 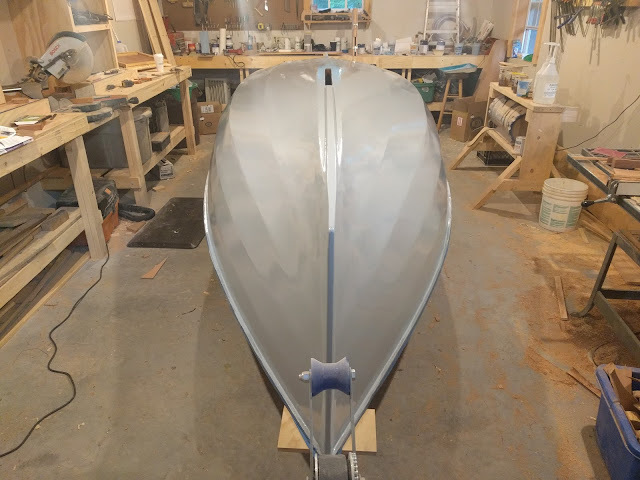 Another coat of primer, another round of very minor fairing, followed up by a final coat of primer and 220 grit sanding and I was ready for real paint. When I say ready, I mean good enough for me. I like a nice finish, but I can only go so far before I call it quits. Other's may be much more meticulous here, but I know that the boat is going to spend it's life getting rammed up on beaches and rock shelves and trailers and I want to use it, not show it. 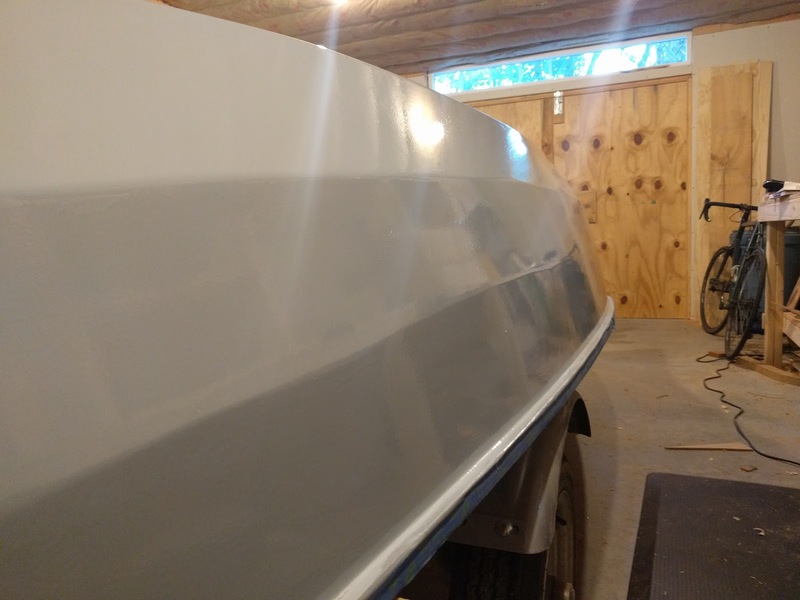 For the real paint, I went full stack with TotalBoat products from Jamestown Distributors and chose TotalBoat WetEdge one part polyurethane paint in Kingston Gray. I've used 2 part paints in the past (Interlux stack), and they do produce a very nice finish, but they are expensive and a bit finicky to use. I hadn't used TotalBoat polyurethane before, but I've used Brightsides in the past with decent results and I suspect they are probably made in the same factory (TotalBoat is slightly cheaper too). I mixed up a quart thinned to 10% with their 'special brushing thinner' and went to work with an enamel/urethane 6" foam hot dog roller and did the margins with a good brush where the roller couldn't reach. 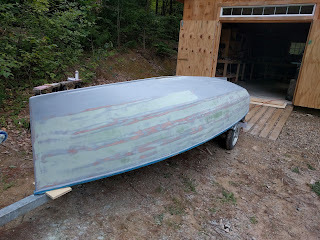 The first coat took about 2 days to harden up enough to sand (it has been really humid here in Central NH) and I did the second (and hopefully final) coat last night. The humidity levels dropped yesterday afternoon and when I closed up the shop for the night I put a heater underneath the boat to speed up dry time. When I checked on it this morning the shop was a nice warm 85 degrees and the paint was dry to the touch. From what I can tell so far, I think it looks pretty good. With the thinner added, it leveled nicely and I don't see any brush or roller marks. It's not perfect by any means though. 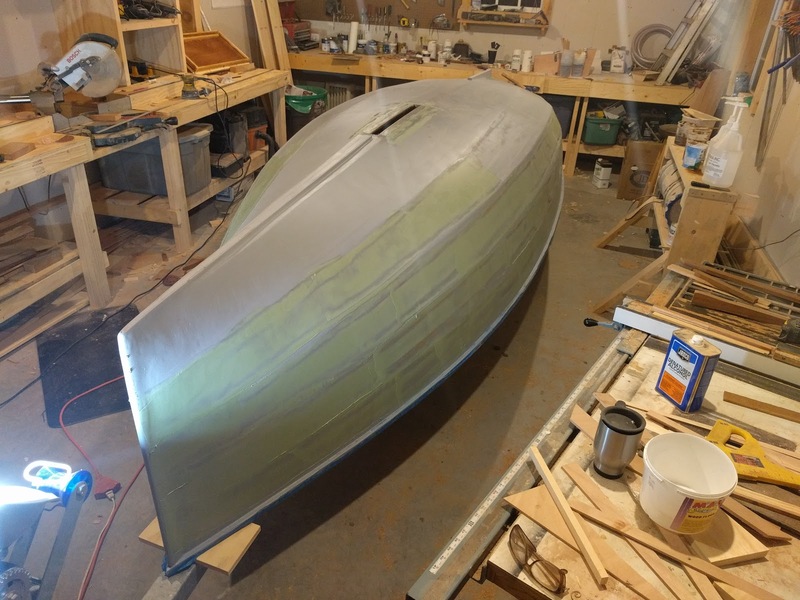 I can vaguely see where the panels are scarfed if you follow the reflection across the bottom of the hull, but there isn't anything I can do about that now. I'm ready to move on.